The Centre for Retail Research (CRR) is warning that High Streets could see 20% of their shops close down within five years as more people turn to the internet for their shopping. The organisation, which conducts research into retail, technology and crime, says this would equate to 62,000 shops closing down. The CRR believes large areas of the UK's High Streets would become housing. It also says as many as 316,000 workers would lose their jobs. The CRR says online shopping will continue to expand and the proportion of shopping done via the internet will double to 22%. The report, which was produced by Prof Joshua Bamfield, said the first shops to go would be pharmacies and health and beauty stores. Retailers specialising in music, books, cards, stationery and gifts will be next. DIY shops will also suffer. In its report, the CRR compares the costs of opening a High Street store and an online warehouse. It says opening a small store on a High Street in the Midlands would cost about £10,000 a month, whereas opening an equivalent space in a warehouse on the outskirts of a similar town would cost between £650 and £1,800 a month. The director general of the British Retail Consortium, Helen Dickinson, said the country would have to get used to a very different look and feel on the High Streets of the future. The CRR estimates that there are about 280,000 shops across the country. Closures on the scale predicted by the organisation would leave 220,000 by 2018. 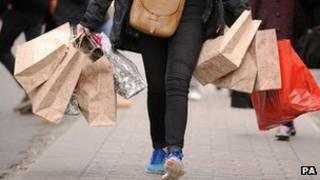 It points out that 16 major retailers have gone into administration this year, with the loss of almost 15,000 jobs. The latest official figures on retail spending from the Office for National Statistics (ONS) showed retail sales volumes in April were 0.5% higher than a year earlier, much less than expected, with consumers increasingly using the internet to do their shopping, rather than going out.